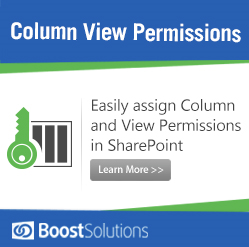 SharePoint Boost Column/View Permission gives you the ability to upgrade and enhance your default SharePoint Lookup experience with additional features and functions. With this powerful add-on of you get the ability to create and manage your own customized column and view permissions and even define permissions using conditions so that values of certain fields define permissions dynamically. Release 3.3.702.0, available from July 2012, has added some new features and has a 30 day trial period. 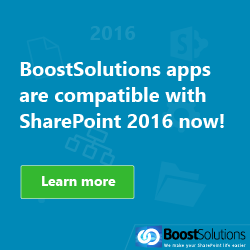 If you are in the market for other great add-ons from SharePoint Boost, you can get a 30% discount off a package which includes: Column/View Permission, Item Permission Batch and Permission Batch. Here is an overview of the great features that were available in the previous release (2.0) such as the ability to protect columns by setting hide or read-only columns for specified users; Protect views by setting hide or read-only views for specified users; Hide or read-only column/views using conditions; Exclude specified users or groups from the permission scope; Import or export permission settings; Set attachments to hide or read-only; From the current list or an external list, dynamically assign permissions to users which are represented by the Person or Group column; and Hide buttons on the ribbon menu for individual views. 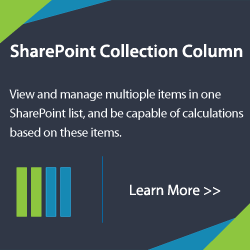 These excellent features enhance the ability of SharePoint and if you have used version 2.0 then you will already know how great these features are at helping you create and manage column and view permissions. But you are now asking what additional features do I get in the new release? Here are some of the new features available for you in version 3.0: The ability to hide or read-only columns/views on web services; Publish Column View Permission API and compatible with SharePoint Boost products; Read-only column on object model level; Specify default view for every user; Disable create or edit view; Supports Alert Me; Read-only column content on the datasheet view; and Seamlessly package list settings within site and list templates. So how powerful is Column/View Permission? First the Column Permission function lets administrators globally enable or disable the Column Permission settings configured with Column Permission. In the Permissions Settings section an administrator is given the ability to overview all Column Permission settings already set up. Each setting part can be deleted, enabled or disabled. Still within Permissions Settings the status field displays whether a settings part is enabled or disabled. In the Advanced Settings section, administrators have the option to decide if the read-only columns can be edited on the object-model level, or by applications which use object-model. Importing and exporting permissions are based on XML files and is as easy as one click. A pop-up window allows for the pasting of XML file contents into the designated area, or browse for a file to upload it and you are ready to import. Exporting also has a pop-up window that displays the XML file content that can be saved to any location to make it reusable in other lists. This is just a small view of the power of Column/View Permissions. Still not sure how to set something up or need more information. Not to worry, with an online tutorial, demo, and Frequently Asked Questions section you can you be on your way to creating and managing your own customized Column and View permissions. 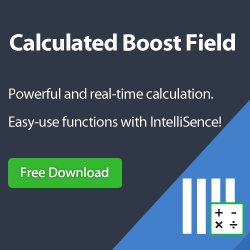 So move quickly and take advantage of this powerful add-on and be on your way to full productivity. So what are you waiting for?